After looking at some tunes and logs of turbo systems, I realized that people don't adjust their NA tune to the new reality of forced induction. I mean, they know to adjust their target AFR and go easy on timing, but what I'm talking about is not knowing _when_ to switch over to the boosted settings. In a normal NA setup you usually trigger PE with >60%TPS@ and 15kPa MAP, which is very tame, but sensible. Boost doesn't happen purely as a function of throttle input and rpm, it is really a side effect of increased load and airflow, which are results of throttle and rpm. With these few indirections involved, you should not rely on just TPS/RPM triggers. First you must figure out WHEN does the boost hit. In a first attempt, I just looked at the common LTFT scan with all data loaded, and it looks like MAP, which is the closest thing we got to a boost measurement in this log, maxes out very early. I wanted to see in context what happens before, during and after MAP maxing out, thus I just played the log in the charts window, concentrating on TPS, RPM, MAP, DynAir, and DynCylAir. 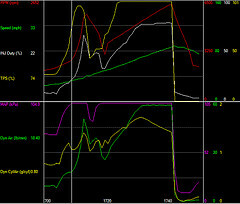 Very similar numbers (74%TPS and 2650RPM), yet we're already getting 0.80g/cyl of compression, which is a great PEAK result for most cammed NA cars, while we're getting it partial throttle and <2700rpm!!! Airflow readings hit a flatline at about 58lb/min and stay there until redline. What the real readings are, we won't know until everything is calibrated correctly with a 2barSD setup. 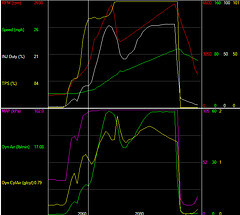 The amazing part about this graph is the torque/compression: 1.24g/cyl!!! I have not seen a NA stock cube motor do that ever. Another great part about it, is that it peaks late (5300rpm) and doesn't drop off much at the redline, suggesting a fantastic powerband. Again, due to the fact we're looking at maxed out readings, this is all pure ballpark, no specific numbers. So now that we know that we the car is healthy, the boost hits early, hits hard (for a basic non-intercooled 5psi kit) and carries way more power that we can currently harness all the way to 6200rpm. Remember at the beginning of this article we were talking about triggers? They were optimized for little torque (0.80g/cyl is a nice number for a small cam, 0.90 for bigger cam, and 1.0+ for a nice head/cam setup), and hitting that torque late on the powerband (LS6 intake usually forces it to be between 4400-4800RPM). Now, we have a whole different paradigm on our hands. This setup maxes out at 1.26g/cyl at 5300rpm, with going into boost at a very early 2650RPM already pushing 0.80g/cyl. 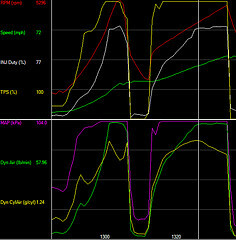 This histogram shows how much compression/torque/air in cylinder we get at different RPM intervals. Looks like somewhere around 2100rpm we can already hit 0.80g/cyl (note this histogram shows max values) which normally is amount of torque we'd be prepared (as in triggered PE mode) at 4400-4800RPM. 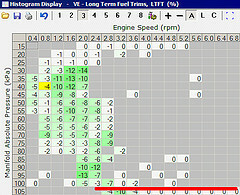 Based on this information, we set Delay RPM to 2100RPM. 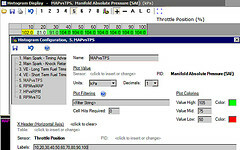 Set the PE Enable TPS table to 35% starting at 2000rpm, and for safety's sake, let's pick 20% all the way at the redline, and blend between them for a sensible curve. Hopefully this demonstrates how you have to watch out for the new conditions created by your new modifications. Also, I posted a lot of configurations of custom histograms, which while not precise with the data gathered, it provides plenty of trending information to make it a worthwhile exploration. Another thing I know I haven't explained yet, is my liberal use of horsepower/airflow/DynAir and compression/torque/DynCylAir. It's another writeup in the making, but for now you just have to take it for granted, so go ahead, push the 'I Believe' button and enjoy your new safer ride. If you have any boost logs taken with a well tuned, well set up (2/3bar MAP sensor, 2/3bar SD mode/CustomOS) please send it to me, as I'd love to have a followup article to this one. If you use the information in this article and you notice that things work better/worse, please let me know, I'd like to know how it works out in a day-to-day operation, as I don't have access to the Camaro with the STS setup anymore.